Over the years my aesthetic has shifted from bold, lots of white, high saturation and low light with a fade. Currently, my aesthetic leans more towards non-direct sunlight, less shadows and a more natural and faded style. I will preface this post by saying that I do not take all of my own images. I’ve been lucky to work with talented photographers that all lend their styles to my images and for almost a year I did acquire a principal photographer to assist me with all of my blog work. I highly recommend this for anyone that has a heavy work load, needs a more streamlined process or isn’t well versed in editing photos. All I had to do was show up, get photographed and head home to await the edited images! However, now I partner with photographers who send me the raw images to edit on my own. It took a little while to find my own aesthetic and I still feel like it’s changing on a daily basis. Below are the quick steps on how I photograph and edit my own photos. To start, let’s talk equipment! I spent the first 9 years of my blogging career using a Canon T3i with a 50mm lens. It’s a really great camera but I wanted something smaller than I could carry around and still allowed for DSLR features. Now, I shoot with a Olympus OM-D E-M5ii and an Olympus M. Zuiko 12-40mm f/2.8 pro lens. Sabrina of Street Scout shot the below images with a Canon 5DSR and a 70-200mm lens. For all images that I shoot on my own, I will use a camera tripod for stability and in low light situations a Neewer ring light for portraits. Lightroom: I import all of my images into Lightroom for the light and colour editing. 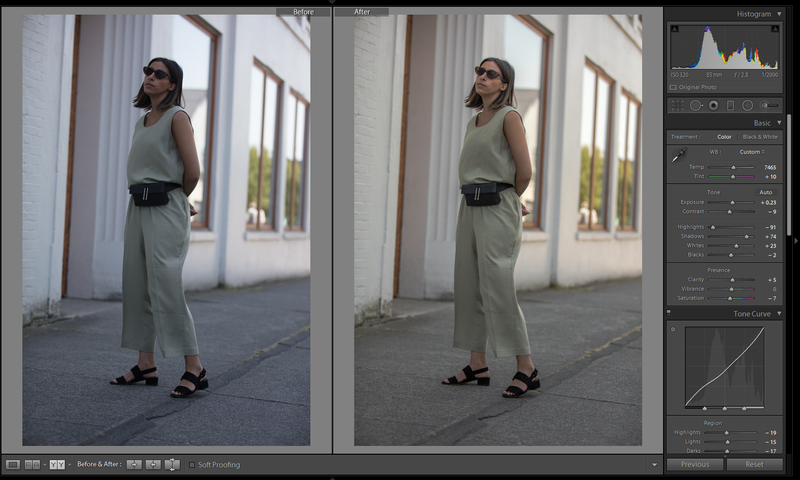 I find that Lightroom is a pretty straightforward program for editing. All of the adjustments you’ll want to make are on the right sidebar of the image and you can split screen to see your edits in action. I also use Lightroom for larger spot treatments like creating lighter or darker backgrounds. Photoshop: After I’ve edited my image in Lightroom, I’ll open it in Photoshop for edits on blemishes, removal of signs, etc. VSCO: I use VSCO for any phone images that I take. I use it as my Lightroom replacement. Snapseed: This is the perfect Photoshop replacement for all phone images. I pull my temperature to the right warmer tones dependent on how the original shot was lit. When I’m shooting in direct sunlight, I’ll adjust the exposure, highlights and shadows. I hope this helps you! Feel free to reach out to me about my choice in camera, lens and editing. My friend Leonie of Noa Noir is also sharing how she edits her photos and they are sttuuuunnniiiiinggggg. Check out her post here.